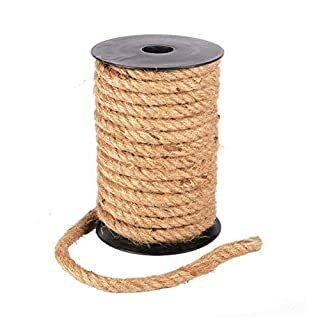 Product Description: Made of Jute Twine. String diameter φ:6 mm. 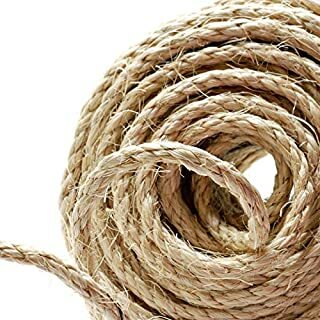 twine grips tightly ,easy to use .Good helper in life.Craft Twine:Great for its use to decorate flower bottles.Perfect for bar decoration, Retro Wedding and Party Décor.Daily Twine: The Organic Ropes are perfect for Protecting Water Pipe Twining, Balcony Guardrail, Stair Handrail. Also can be used to twining Cat scratch board. Give your lovely cat a happy time.It can also be used in Photo Display, Great crafting tool. Very beautiful and Fantistic.Garden TwineIt can be use to industrial packaging, bundling, recycling, handyman and gardening applications.100% Customer Satisfaction Guarantee. We provide outstanding product quality and customer service for no-risk purchasing. 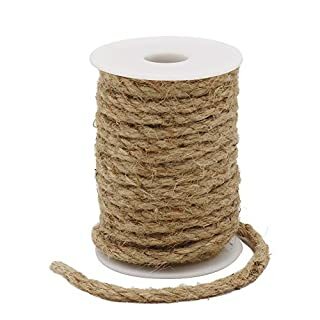 6mm Thick Jute Rope,Natural Strong Hemp Rope Cord Jute Twine for Arts Crafts DIY Decoration Gift Wrapping Product Description: Made of 100% Natural Jute Twine. Eco-Friendly and completely biodegradable. String diameter φ:6 mm. 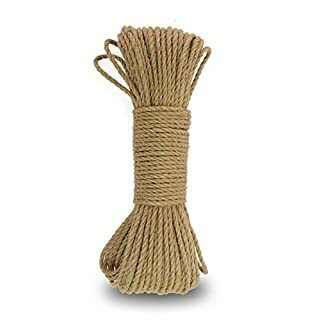 Natural twine grip tightly ,Easy to use .Good helper in life. Craft Twine: Perfect for bar decoration, Retro Wedding and Party Décor. Daily Twine: The Organic Ropes are perfect for Protecting Water Pipe Twining, Balcony Guardrail, Stair Handrail. Also can be used to twining Cat scratch board. Give your lovely cat a happy time. Garden Twine It can be used to shipping application, industrial packaging, bundling, recycling, handyman and gardening applications. 100% Customer Satisfaction Guarantee. We provide outstanding product quality and customer service for no-risk purchasing. 20 Metre length of 6mm polyhemp rope. Polyhemp is a synthetic fibre rope that has the look and feel of a natural fibre rope. Unlike natural fibre ropes it is weatherproof and doesn't shrink when it gets wet, making it ideal for outside use. Garden decking posts, barrier ropes, kids play areas, tug of war rope, climbing ropes and general use ropes. It is strong and durable and does not rot. 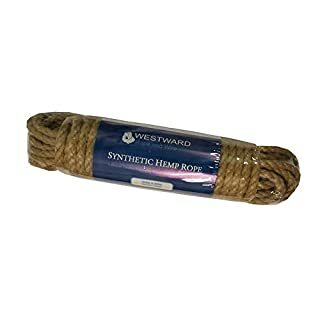 Polyhemp is also popular with boating enthusiasts where it's common uses include fender ropes, mooring ropes or even rigging lines on traditional boats. 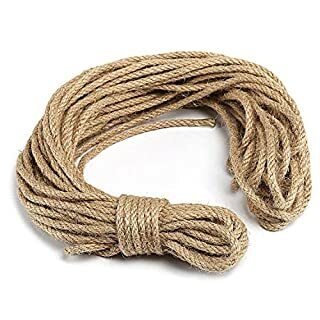 An alternative to the normal colours available in synthetic ropes, this sandy coloured, soft to handle rope has the properties of polypropylene with the look of natural hemp. Our Synthetic Hemp is a natural look rope which conforms to the highest standards. Rope ends are melted/sealed when cut. Our ropes are inspected and checked thoroughly by an expert prior to dispatch. 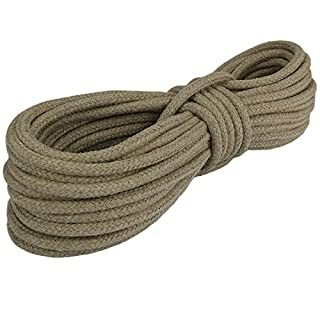 They are packaged in sealed packaging to maintain the quality of the rope. All ropes are sent with a certificate of conformity issued by Westward Rope and Wire stating break loads and specifications of the rope. Also included are care instructions for your rope. We also offer a full customisation service. We are able to whip or heat seal your rope ends, splice soft eye loops, inset metal thimbles, and splice various hardware or attachments to your rope. Please contact us for details. 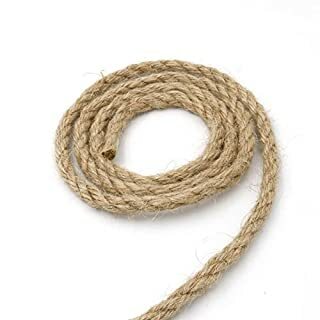 Hemp Rope 6mm 50m 3-strand twisted Grade "A"
6mm Hemp Rope x 20 Metres. 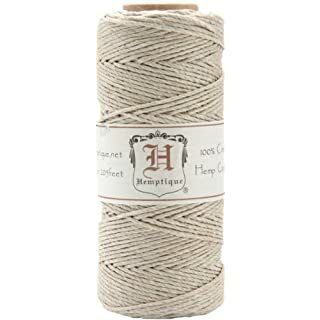 Used for generations and probably the oldest known rope, natural Hemp rope is made from the fibre obtained from the Cannabis Sativa plant. 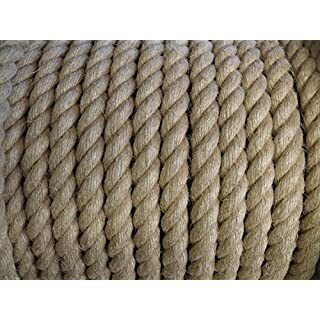 This fibre makes a tough, soft and durable rope that has many uses. If used in a wet enviroment Hemp rope should be treated to stop moisture absorption. 15 Metre length of 6mm polyhemp rope. Polyhemp is a synthetic fibre rope that has the look and feel of a natural fibre rope. Unlike natural fibre ropes it is weatherproof and doesn't shrink when it gets wet, making it ideal for outside use. Garden decking posts, barrier ropes, kids play areas, tug of war rope, climbing ropes and general use ropes. It is strong and durable and does not rot. 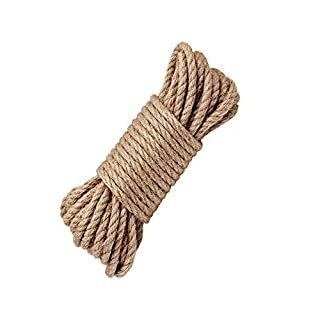 Polyhemp is also popular with boating enthusiasts where it's common uses include fender ropes, mooring ropes or even rigging lines on traditional boats. 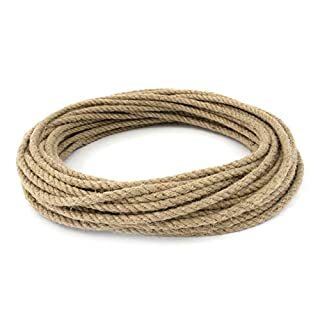 An alternative to the normal colours available in synthetic ropes, this sandy coloured, soft to handle rope has the properties of polypropylene with the look of natural hemp. Our Synthetic Hemp is a natural look rope which conforms to the highest standards. Our ropes are inspected and checked thoroughly by an expert prior to dispatch. Please note that we offer a full customisation service. We are able to 'whip' or seal your rope ends, splice soft eye loops, eye's with inset thimbles, stop knots, monkey fists or splice various hardware or attachments to your rope. Please contact us to discuss your requirements or if you would like a sample. 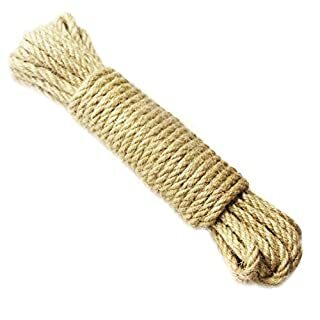 Specification : Product name : hemp rope Material : jute Color / colour : natural color Product dimension : 6mm in thicknees , 10M/32ft in length Application : DIY arts and crafts , light deco , home deco , selfmade basket for organize , cat scratcher stuff , camping Product contain : 1x roll of hemp rope Note : Due to shoot and each computer's different resolution ， real product's color may slightly different from picture Thanks Thank you for choosing Anzirose . If you have any problem about this product , please don't hesitate to contact us . 5 Metre length of 6mm polyhemp rope. Polyhemp is a synthetic fibre rope that has the look and feel of a natural fibre rope. Unlike natural fibre ropes it is weatherproof and doesn't shrink when it gets wet, making it ideal for outside use. Garden decking posts, barrier ropes, kids play areas, tug of war rope, climbing ropes and general use ropes. It is strong and durable and does not rot. 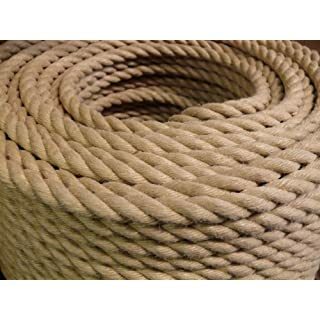 Polyhemp is also popular with boating enthusiasts where it's common uses include fender ropes, mooring ropes or even rigging lines on traditional boats. 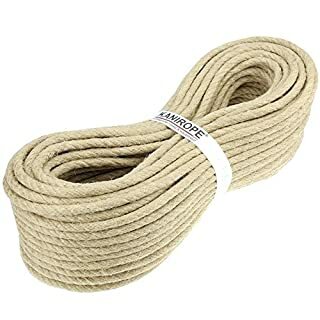 An alternative to the normal colours available in synthetic ropes, this sandy coloured, soft to handle rope has the properties of polypropylene with the look of natural hemp. Our Synthetic Hemp is a natural look rope which conforms to the highest standards. Our ropes are inspected and checked thoroughly by an expert prior to dispatch. Please note that we offer a full customisation service. 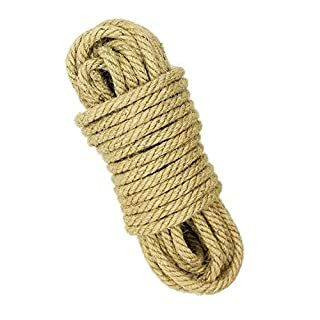 We are able to 'whip' or seal your rope ends, splice soft eye loops, eye's with inset thimbles, stop knots, monkey fists or splice various hardware or attachments to your rope. Please contact us to discuss your requirements or if you would like a sample. 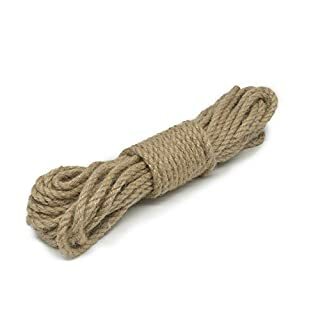 The Advantages of Choosing This Hemp Rope ♥ Material: The real jute from the country of origin - Bangladesh guarantees the quality of the product. Safe and nontoxic, to use with confidence. ♥ Features: natural jute, durable and high corrosion resistance, good permeability and ease of use. ♥ A variety of choices: different specifications to choose from, to meet your needs of life, to provide you with convenience. ♥ Wide range of uses: DIY, lampshade, crafts, gift box packaging, garden decoration, cat house, photo frame, etc. 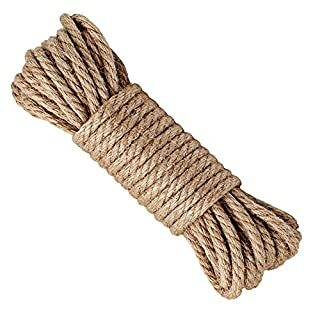 ☞Tips: The hemp rope is made of the epidermis of the plant.Therefore there will be vegetable fibers (light burrs) on the surface, slightly pilling, which is normal. During the treatment process, softened oil (safe and nontoxic) will be added. There will be an odor of oil that will disappear over time. Do not hesitate to use it.